I read tweets for inspiration on how I want to live. This is probably the most focused tidbit to live by. 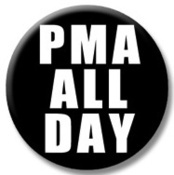 PMA – Positive Mental Attitude! A positive mental attitude can set you up right in every situation. Wake up – PMA, decide what to eat – PMA, go to work – PMA, someone is mean to you – PMA, have to work late – PMA, go to the gym – PMA, is this really what I should be doing with my life – PMA, go to bed – PMA, sweet dreams – PMA. Just keep PMA in your mind in every thing you do and you will changed your course in life. I am going to try it in 2012 and see what happens!! Greatness is on the horizon. I can taste it. More information on the PMA and OLOC movement, click here!